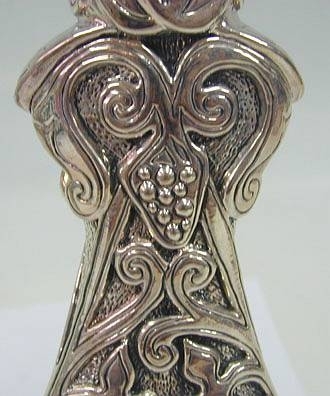 Sterling Silver Grapes And Vines Candlesticks Beautiful artisan Sterling Silver grapes and vines candlesticks. 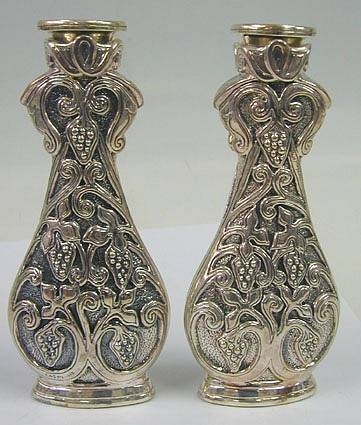 These amazing candlesticks are shaped in a feminine form standing on an elliptic spreading base, they are completely covered with decorations of grape clusters hanging from scrolling vines. 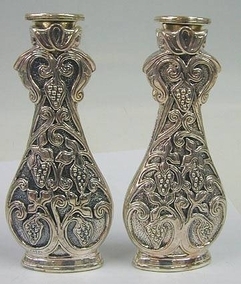 The top of the candlesticks are in a shoulder shape with the nozzles which are decorated with the same scrolling vines motif and they are in the place where the head would be. These candlesticks were made in the electroforming method. Measurements : Marks : Height: 8.6in. / 22cm. Max width: 3.6in. / 9.14cm. Bottom width: 2.9in. / 7.36cm. Thickness: 1.5in. / 3.8cm. Top diameter: 1.85in. / 4.7cm. 1 inch = 2.54cm 925 for Sterling Silver and maker´s mark. Weight : 868gr. / 27.9oz.